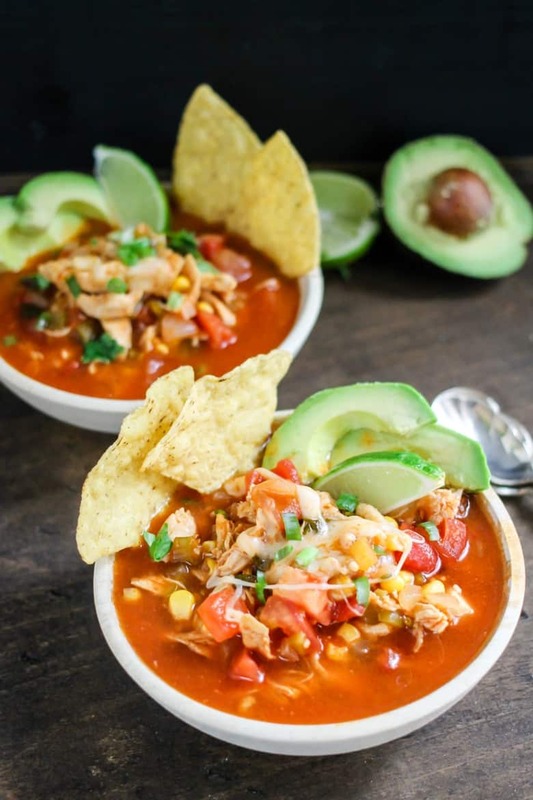 Over 30 of the best crockpot soup recipes to add to your recipe collection. You will find slow cooker recipes for hearty soups, light soups, vegetarian soups, creamy soups, and more! Plus, 'tis the season for soup! 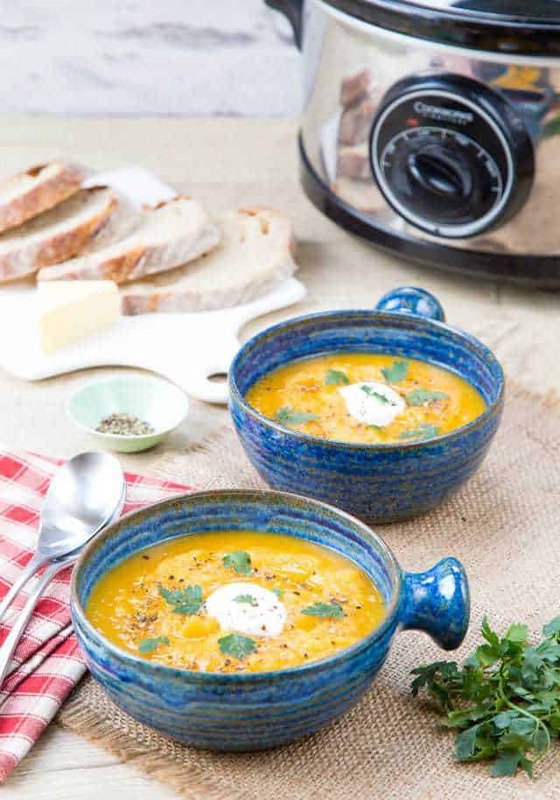 Fall and Winter are the perfect time to enjoy a nice hot bowl of soup. Soup is the epitome of comfort food in my book, and these cold nights have me making a pot of soup often. I love how easy soup is to make, and how it does a great job of warming my bones. 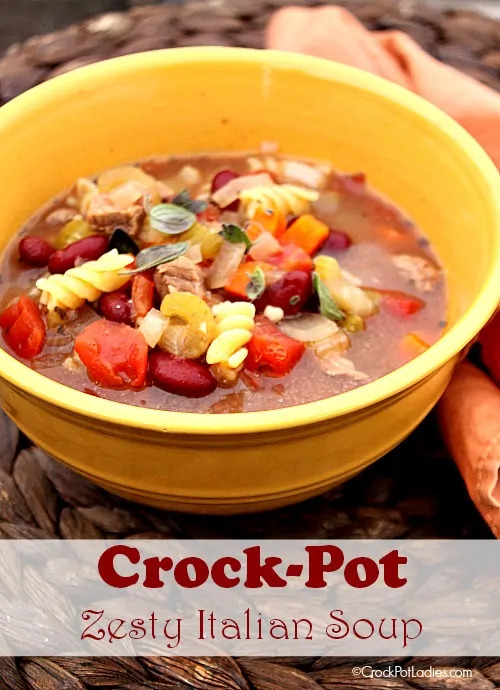 The best part is, when you make one of these yummy crockpot soup recipes, you can sit back and let your crock pot do all the work. 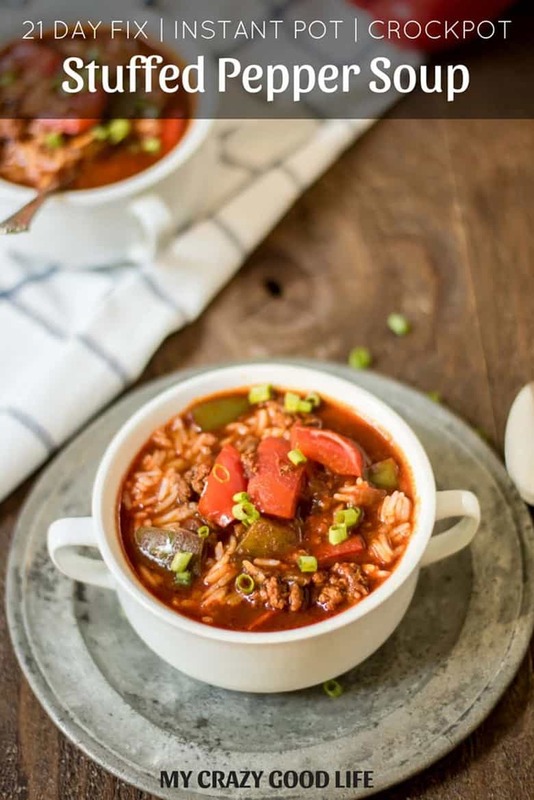 Some of these crockpot soup recipes are as easy to prepare as adding all the ingredients to the slow cooker and turning it on. At most, they may require you to do a bit of prep work such as chopping veggies or browning meat. Then you can go about your busy day and let the soup cook itself. 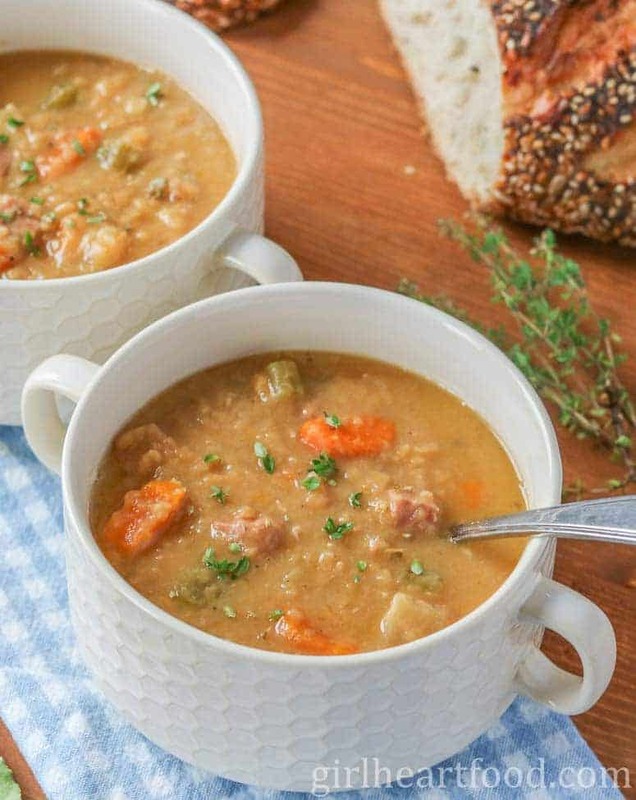 Okay, now onto these amazing crockpot soup recipes! Baked potato soup has always been one of my favorite comfort foods. 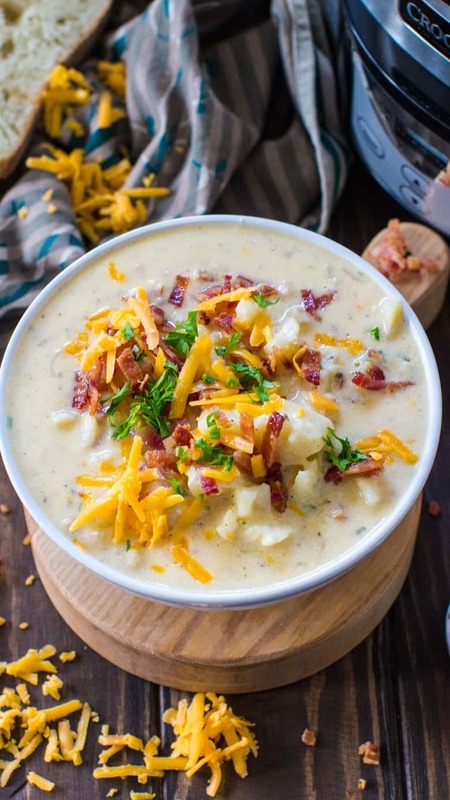 This super creamy slow cooker baked potato soup recipe is easy to make, and budget friendly too. If you want to make it vegetarian, just leave out the bacon and you are good to go! 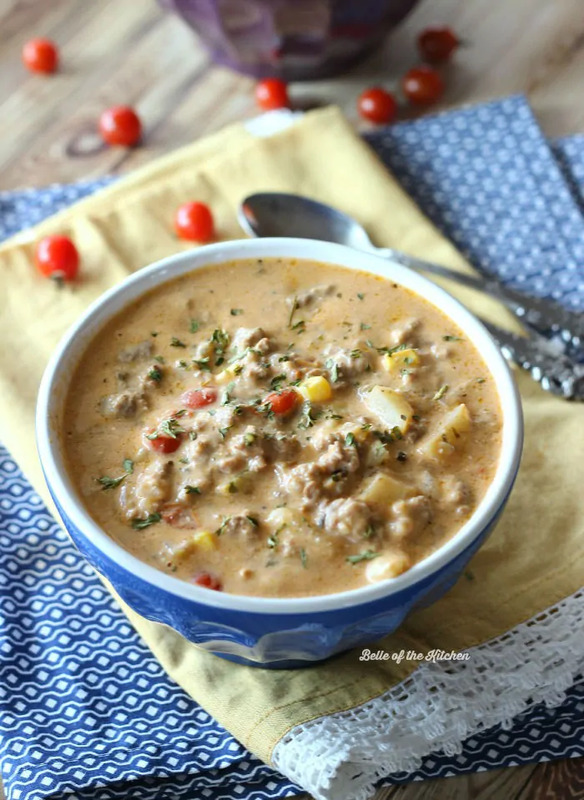 Packed with beef, cheese, corn, potatoes, and celery, this hearty cheeseburger soup would be the perfect dinner on a chilly winter evening. If you are looking for a soup recipe using ground beef, you should definitely try this delicious cheeseburger soup recipe. 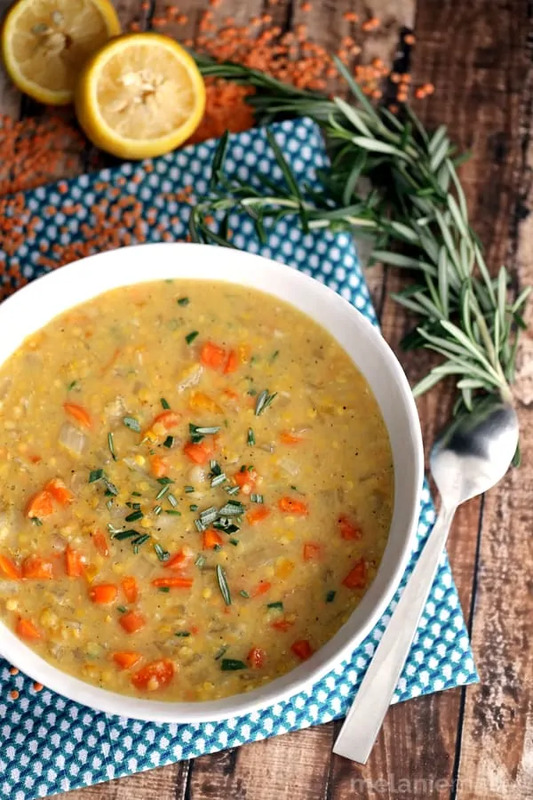 Curl up with a bowl of this tasty lemon rosemary lentil soup and you will be in heaven. Plus, filled with carrots, bell peppers, and red lentils, this slow cooker soup recipe packs a whole lot of veggie power. Looking for crockpot soup recipes that are hearty enough to satisfy a hungry family at dinner time?! 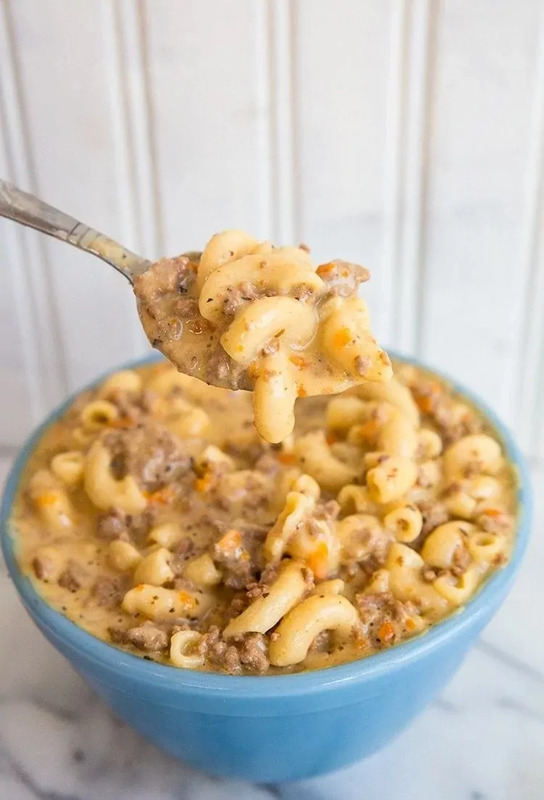 Try this macaroni cheeseburger soup. Even the little ones will enjoy this cheesy and beefy macaroni soup. Broccoli and cheese soup is one of my go-to comfort foods. All that melty cheese is just magical in my opinion. 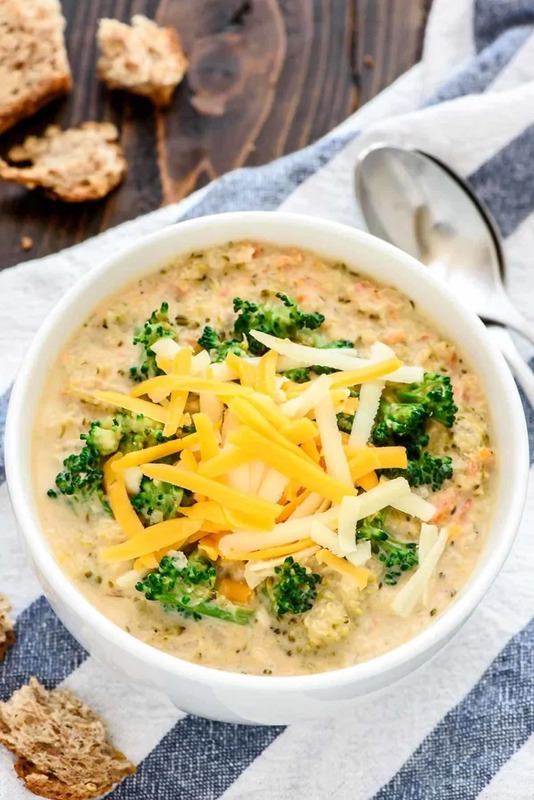 If you are a cheese lover like I am, you will love this easy slow cooker broccoli cheese soup recipe. 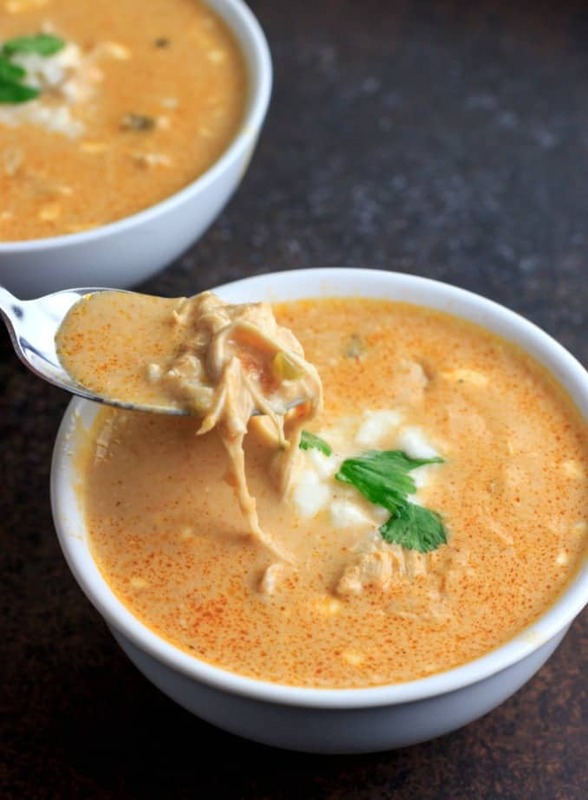 If you would prefer a lighter soup over a creamy and cheesy soup, you will love this light and flavorful Mexican chicken soup. You can add the toppings of your choice to customize this tangy Mexican soup as well. Bring on the avocado and crushed tortilla chips! Have leftover turkey from Thanksgiving? Why not use it to make a pot of this tasty barley soup. 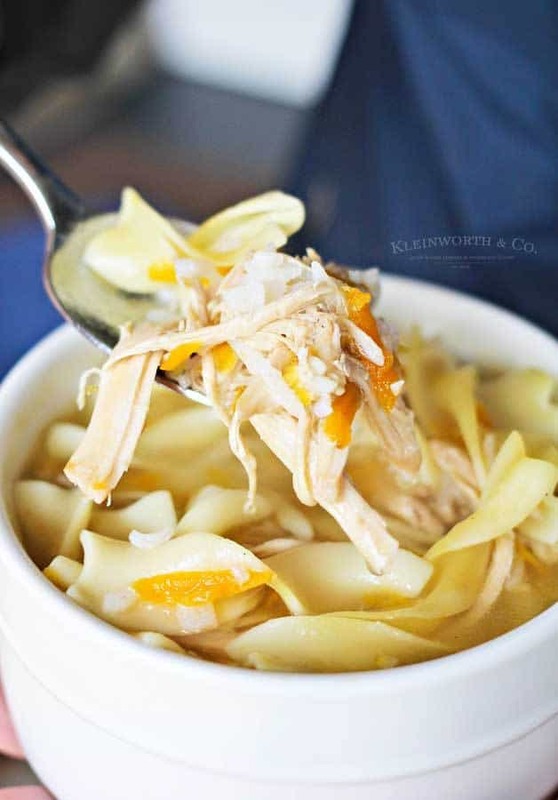 This thick creamy chicken noodle soup recipe is easy to make using frozen egg noodles. I have never used frozen egg noodles in a soup recipe before, but this recipe has got me adding them to my shopping list! This Beefy tomato macaroni soup is thick and hearty enough to serve as a meal. With hamburger meat and noodles, even the kids will love it! I mean what kid doesn't love hamburgers and noodles? 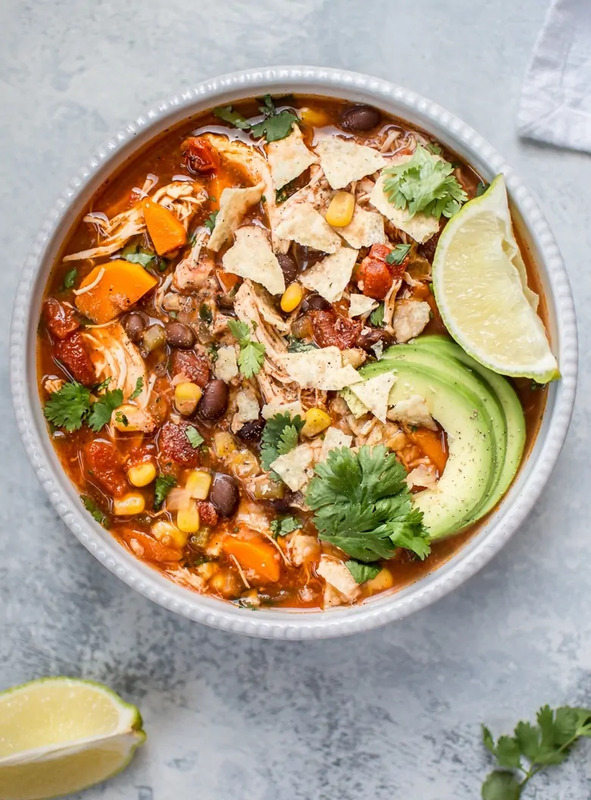 Just 4 ingredients are all that you need for this easy Mexican chicken soup. If you are looking for a soup that is packed with flavor but not packed with carbs, this right here is the soup for you. 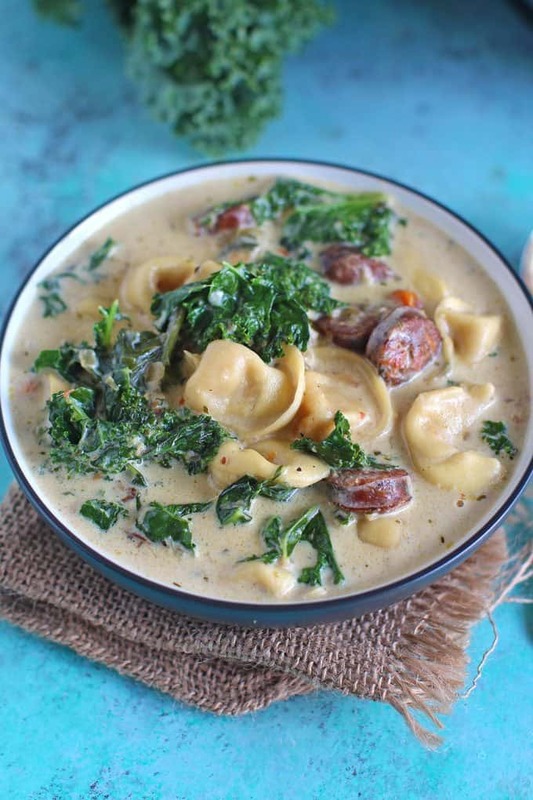 With italian sausage, tortellini, kale, and spices, this flavorful soup will have you thinking that you are dining at a fancy Italian restaurant. 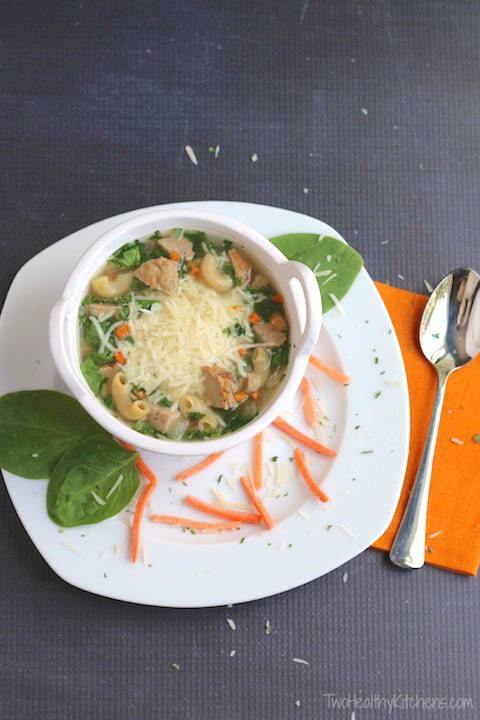 But in reality, this creamy tortellini soup is easy to make right in your slow cooker. Packed with veggies such as zucchini, tomatoes, carrots, spinach, and green beans, this crockpot soup recipe is perfect if you are looking for a vegetarian slow cooker soup recipe. Made with beef, beans, noodles and veggies, this is a filling option that is perfect for dinner. And you will never guess what the secret ingredient in this soup is! A hot bowl of cabbage soup is perfect on a chilly winter evening. 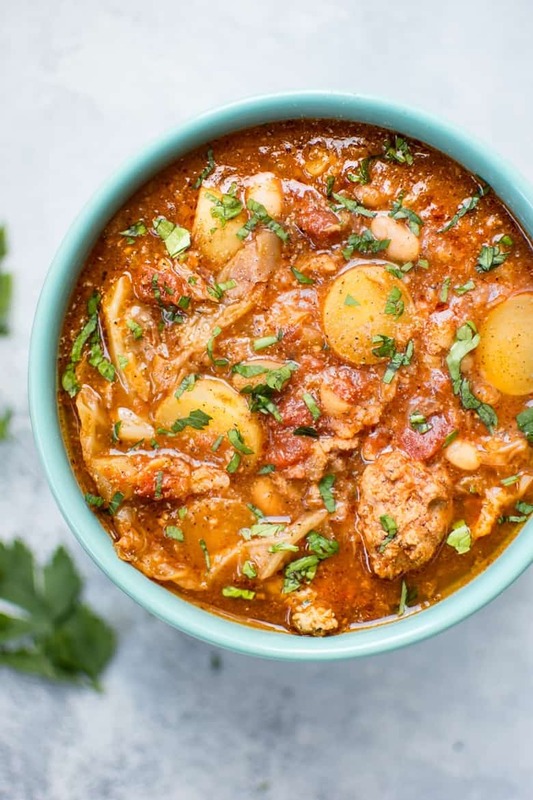 Pork sausage, white beans, potatoes, cabbage, and spices come together to make one wonderful slow cooker cabbage soup. This Mexican-inspired slow cooker soup recipe is perfect for when you are craving something with a lot of flavor. You even have the option to swap out the chicken for beans and make this a vegetarian crockpot soup recipe instead. Either way, it is sure to be amazing! 16. 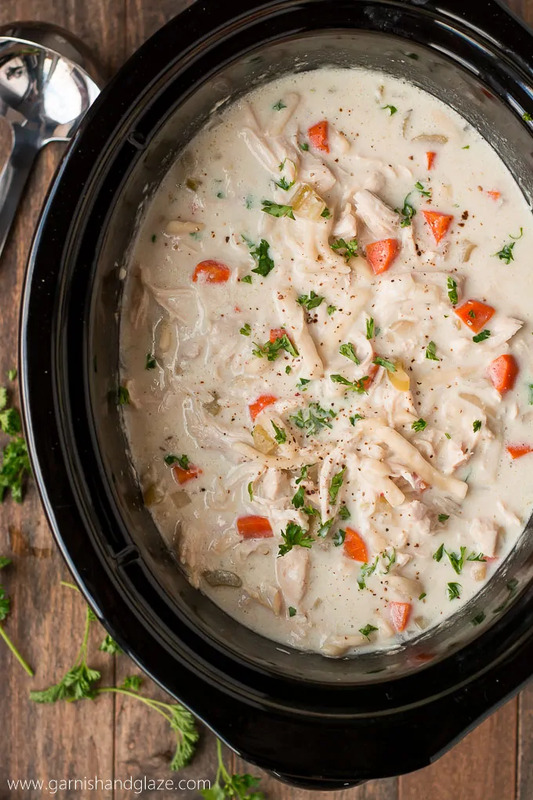 Crockpot Turkey Rice Soup from Kleinworth & Co. 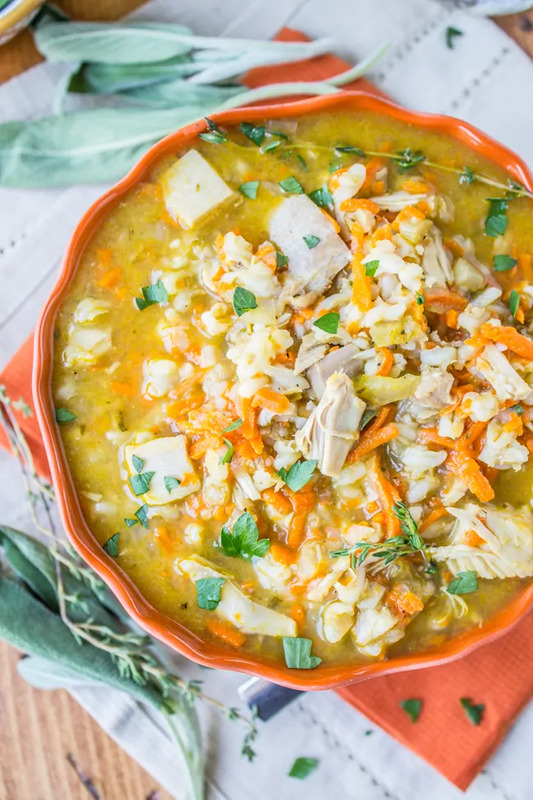 Perfect for using up Thanksgiving leftovers, this turkey rice soup will have you wishing you had turkey leftovers every day of the year. Loaded with ground beef and two types of beans, this delicious taco soup is hearty enough for the main course. 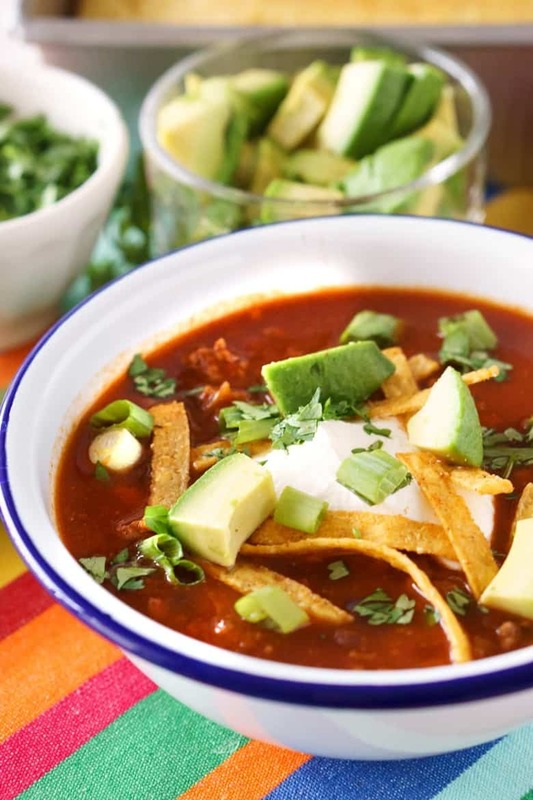 Top this tasty taco soup with a some yummy avocado chucks and tortilla strips for a real treat! Have leftover ham from Christmas or Easter?! 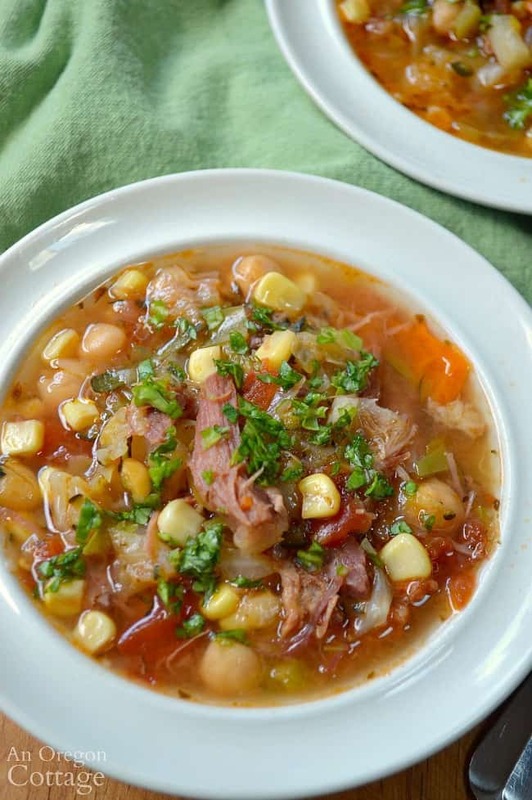 Put that ham bone to good use with this ham bone soup recipe. 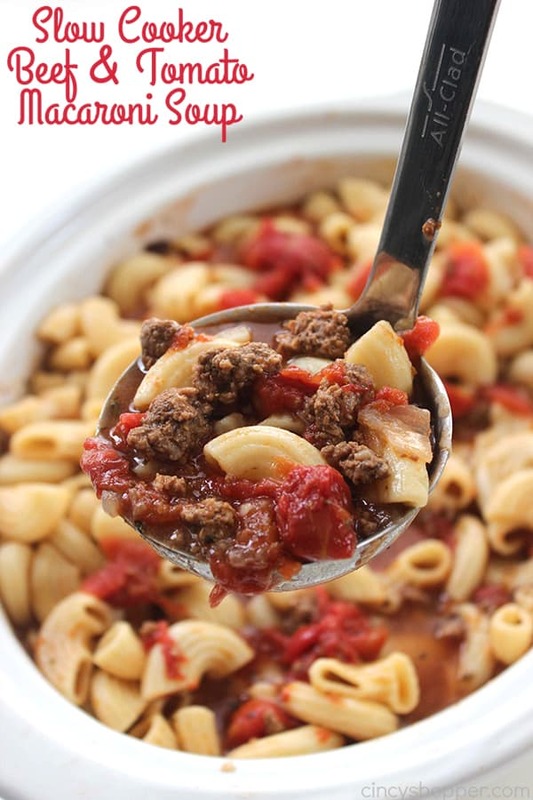 With options to cook it in the Instant Pot or stove top as well the crockpot, you have several options to make this great recipe. 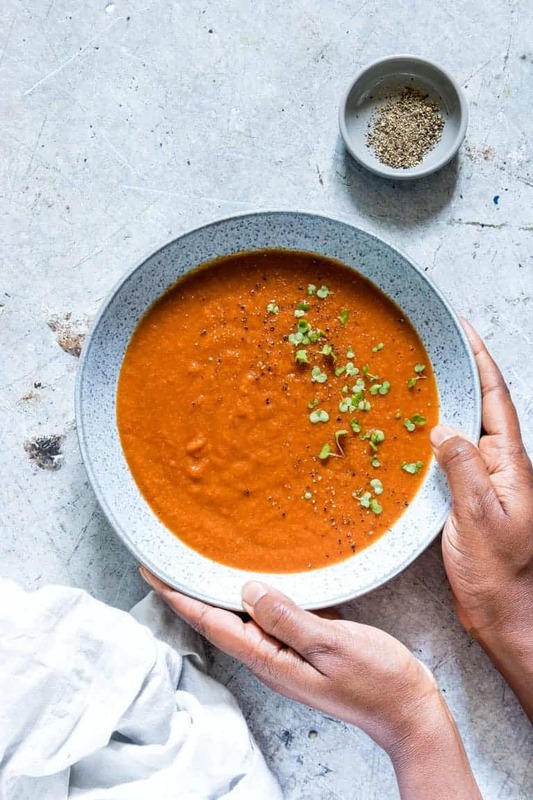 Packed with flavor, but not with carbs, this easy-to-make tomato soup is a perfect option for those on a gluten-free, vegan, low carb or paleo diet. Cheesy goodness that is low carb to boot?! Count me in! 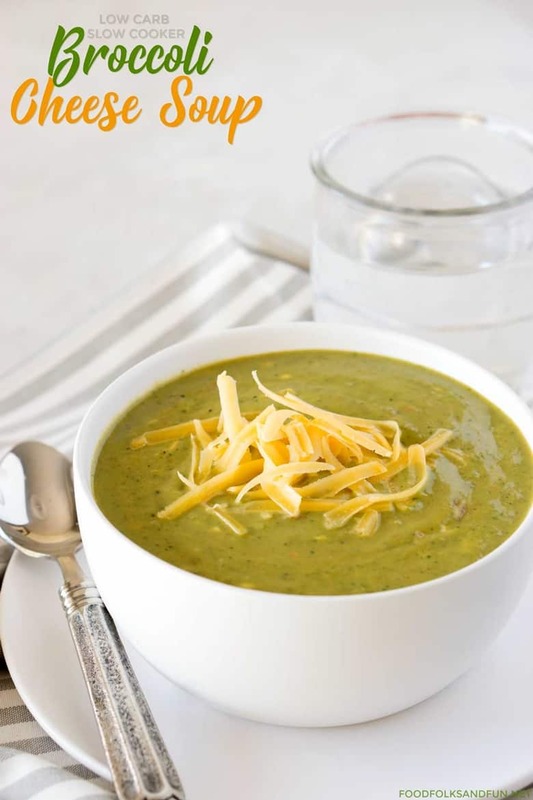 This creamy, cheesy, broccoli soup is perfect for those trying to cut carbs, and for us who just love a good soup as well! A lightened up version of my family's favorite — chicken pot pie. The best part is, this from-scratch chicken pot pie soup recipe is surprising simple to make with only 10 minutes of prep work required. 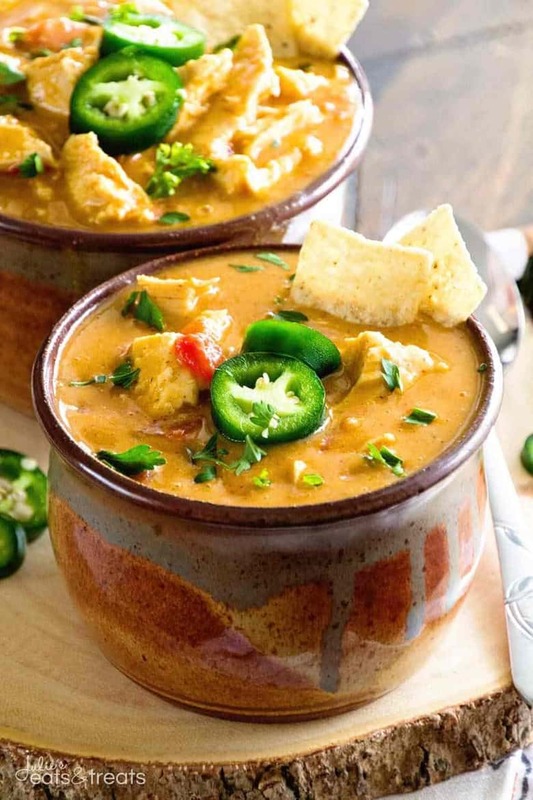 This tasty chicken salsa queso soup recipe is great for those that like a bit of spice. It is also an excellent slow cooker soup option for those on a keto or gluten-free diet. With options to make it in the Instant Pot or crock pot, the choice is yours. 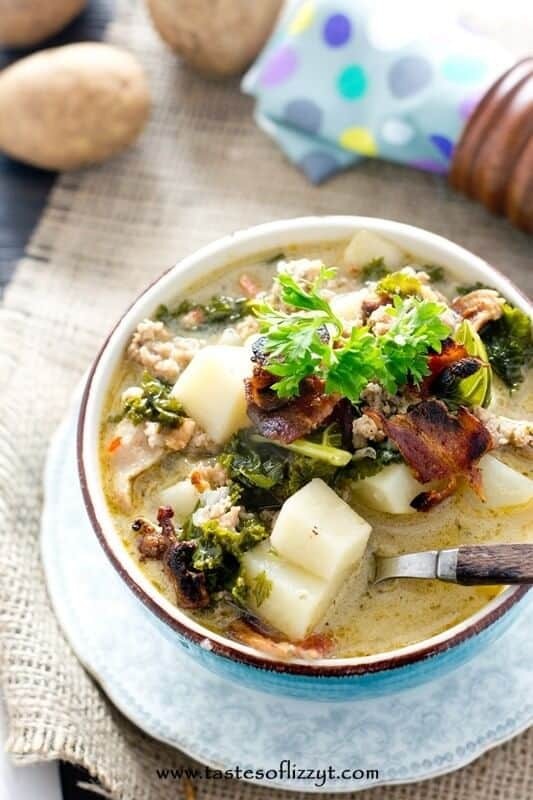 For those on a paleo diet, this zuppa toscana crockpot soup recipe is loaded with bacon, sausage, and potatoes. Or maybe you are just a meat and potatoes type, like my husband. Either way, I bet you will approve of this slow cooker zuppa toscana recipe! 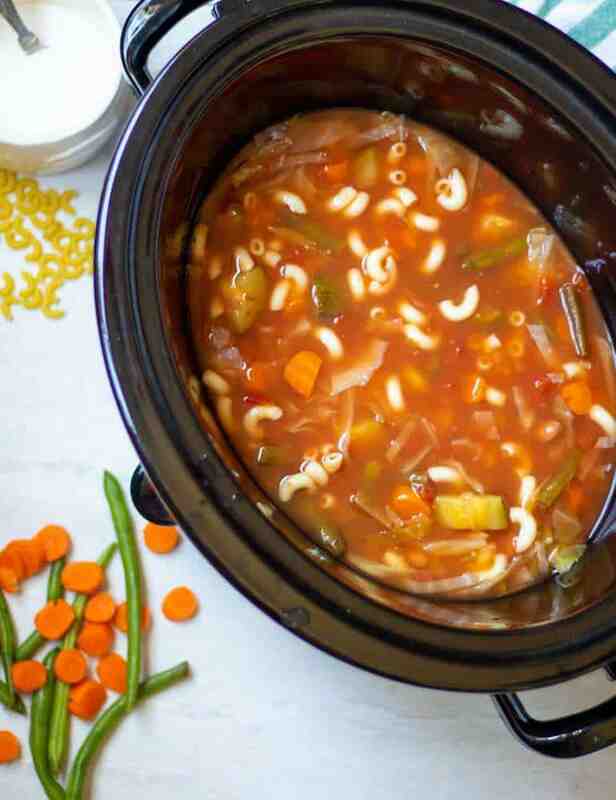 Looking for Italian crockpot soup recipes?! Try this Italian classic made right at home in the crock pot. Made with meatballs, veggies, and pasta, this Italian wedding soup has a little bit of everything. 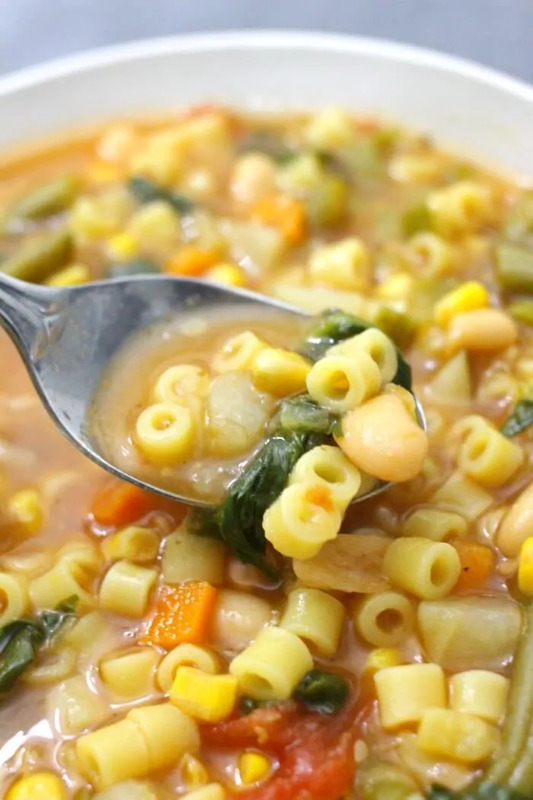 Loaded with beans, veggies, and pasta, minestrone soup is a true classic. Perfect to curl up with a bowl of on the couch on a chilly evening. Sprinkle a bit of fresh parmesan on top for a real treat! 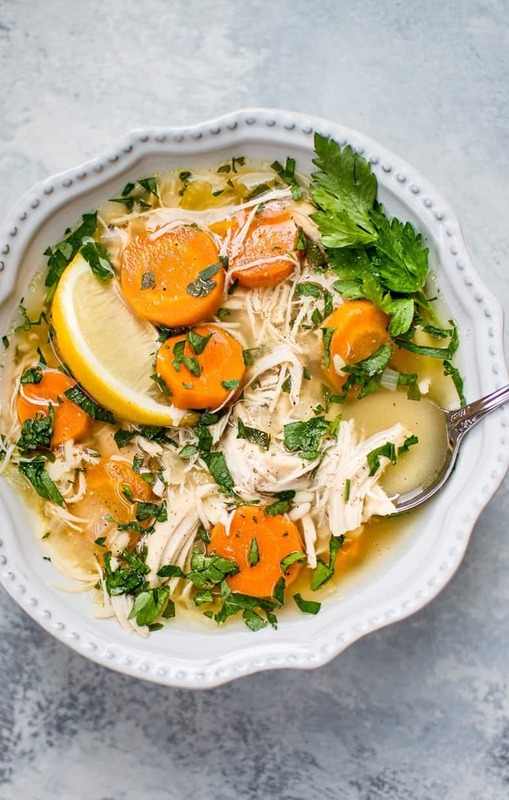 If you are looking for light and healthy crockpot soup recipes, you will love this lemon chicken orzo soup recipe. This flavorful soup is easy to make, and great for when you are feeling under the weather — or any day! 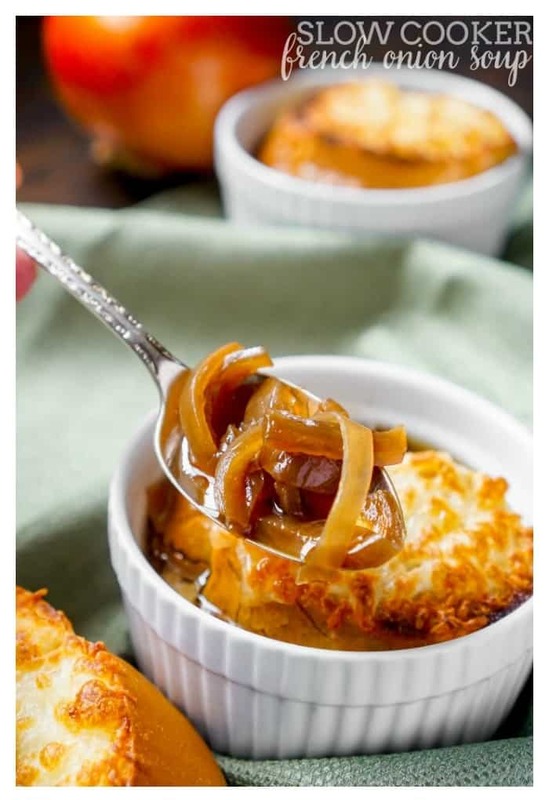 French onion soup is my all-time favorite soup. Ever since I was a little girl I have loved French onion soup. Between the cheese, the onions, and the bread on top, there is just so much to love. But, it wasn't until now that I discovered my favorite soup could be made entirely in the crockpot! If you love stuffed peppers, you will love this easy to make stuffed pepper soup. If you are looking for a lighter recipe, simply swap out the ground beef for ground turkey. Yum! It is difficult to believe that this creamy and delicious soup is actually fat free — but it is! 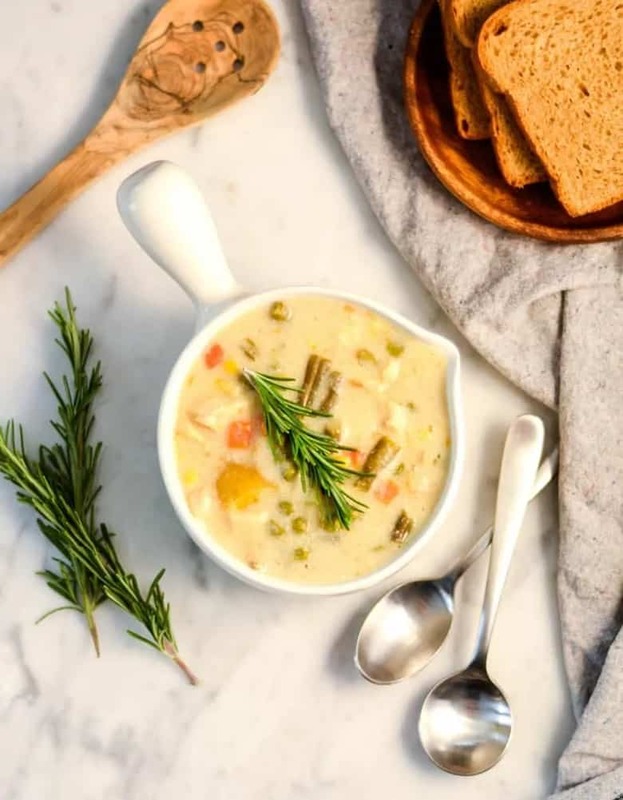 Made with root vegetables, this soup is packed with nutrients and a healthy meal option for any day of the week. 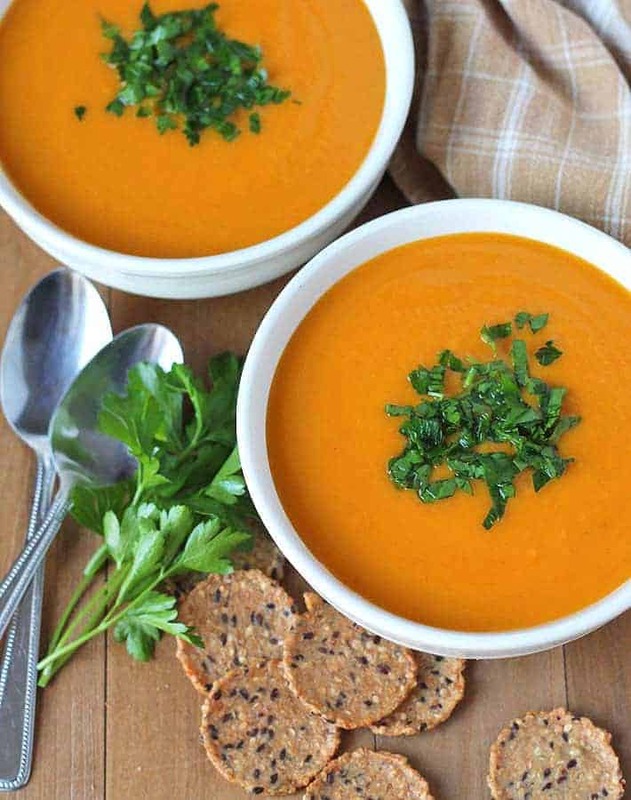 Smooth, creamy, and a beautiful shade of orange, this sweet potato and butternut squash soup is great for those looking for a vegan or gluten-free crockpot soup option. I can't get over how beautiful its color is! Next up, we have an incredible split pea soup recipe made with ham, yellow peas, and lots of veggies. But if you were looking for a vegetarian split pea soup recipe, have no fear – the author give info on how to make it without meat as well. 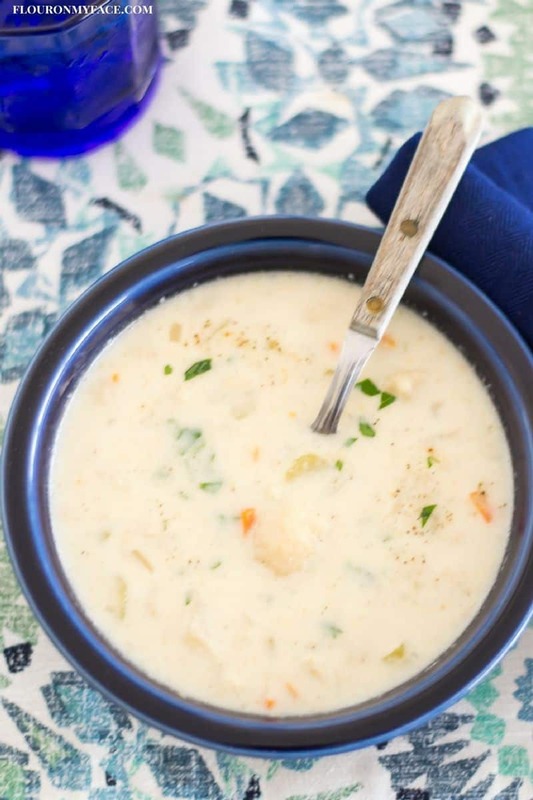 If you are a fan of cauliflower, you need to try this crock pot cauliflower soup recipe. Creamy and cheesy, this low carb cauliflower soup is a hit with those on a low carb diet as well as those who aren't. 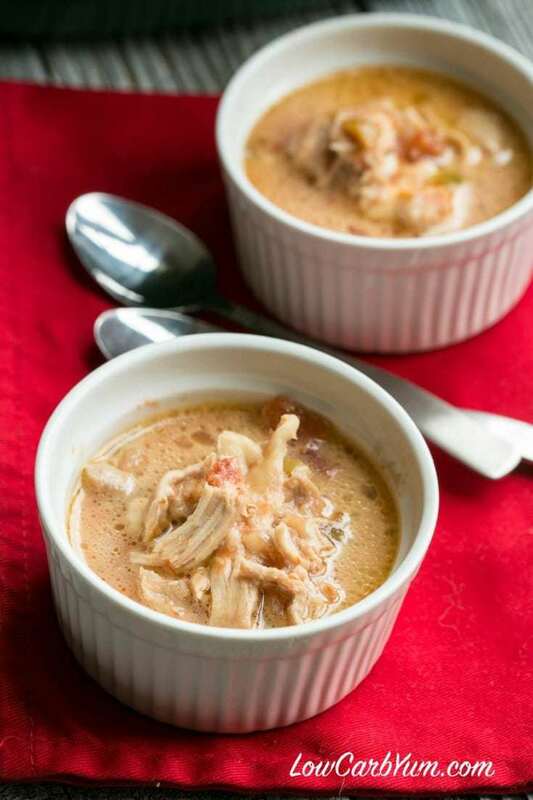 A crockpot soup recipe with the flavor of a classic Tex-Mex king ranch chicken casserole. If you have not familiar with King Ranch casserole, you might be surprised to learn that the casserole doesn't use any ranch dressing or ranch seasoning. The name “King Ranch” actually comes from the name of a ranch in Texas! The level of spiciness can be tailored to your liking, so don't hesitate to try this amazing soup. 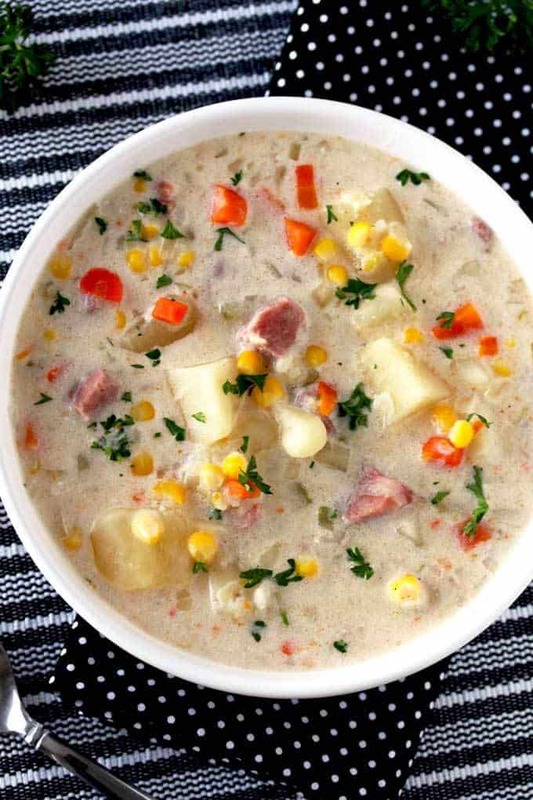 If you are a meat and potatoes type, this slow cooker ham and potatoes soup will be perfect for you. It is super simple to make and gluten free as well! 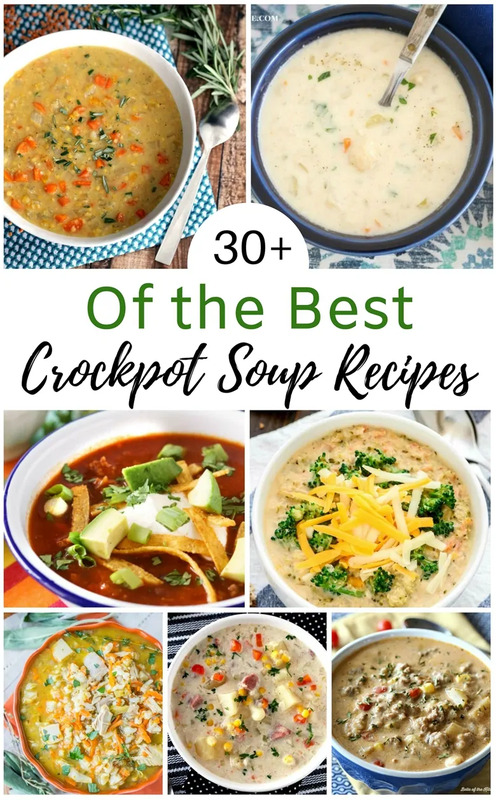 Let us know which of these awesome crockpot soup recipes is your favorite in the comments below! What a great collection of soups! Perfect for this chilly weather. Such a great selection of soup recipes! Thanks for including my recipe. Soup is my favourite fall meal. I can’t wait to try these recipes. I love all these great soup recipes we’re big soup eaters.Thank you. Oh my those all look delicious! I love the lentil one and the broccoli and cheese one the best. That’s a an awesome collection of soups. My husband loves soup and the butternut squash recipe looks like it’s going to be up his alley. Thank you for sharing.